Many bakers who work from their home start out as people who love to create amazing desserts or breads. Their individual style shows in their baking and people love to taste their creations. This hobby can quickly grow into a business that provides a source of income for what you do best. Helping you protect your business is what we do best. Protection for errors that you make in the course of doing business that cause financial loss to others. 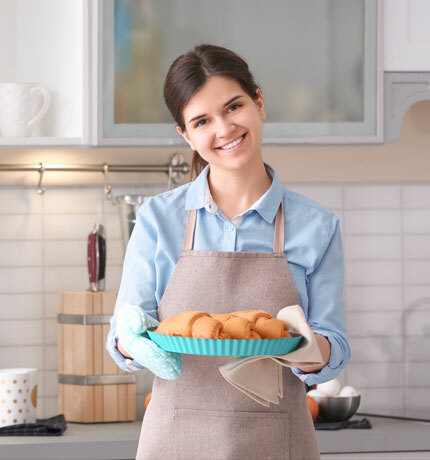 For example, you incorrectly schedule to make desserts for a baby shower on Sunday when the event is on Saturday and you cannot make the desserts in time. Professional liability would provide coverage for any extra expense that the host incurs in finding new desserts at the last minute. Protection for the lost income due to your home being uninhabitable. For example, your home has a fire and you need to rent temporary space at a commercial kitchen on a part-time basis to fulfill orders. The extra expense incurred due to the fire would be covered. Know your suppliers - Ensure that favorable contracts with suppliers are in place in the event that you get sued for a foodborne illness that can be traced back to the supplier. Understand state and local regulations - The best way to be sure that you understand state and local food regulations is by going to your state’s Department of Health website. Have a backup plan - Partner with a licensed commercial kitchen to rent space during busy periods.